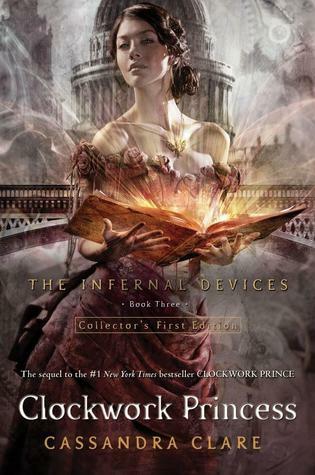 Clockwork Princess by Cassandra Clare Review - My Life Is A Fairytale That Will Never End. It was Tuesday, March 19th. And I was working at 6AM till 2PM. God, I was so pissed off, I wanted to be the first one at the door of Waterstones when they open. Well, I went straight after work. I was complaining to my friend how tired I was. And I was. Until I arrived at Waterstones. I started walking faster toward the 2nd floor. Went straight to the Young Adult section and started looking and searching like crazy. I couldn't find it. I ran to the guy that worked there and eagerly asked "Clockwork Princess by Cassandra Clare!!" And he thought a little and then said "I think it's sold out." O_o WHAT?! And then "Check downstairs, maybe there are some copies left". When I say, I was like running for my life, would be an understatement. I started running so fast, jumping the stairs that, believe me, it's a wonder I didn't fall. And then I saw her*. She was there. And I ran and took her in my hands and I hugged her and started jumping and saying "mine, mine, mine" <3. People were staring and I didn't care. Clockwork Princess was everything that I ever hoped for and so much more. 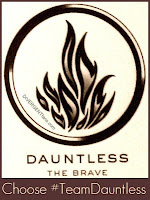 I've said it before and I meant it, Cassandra Clare is a genius. With this book, she made me love her and her book even more, if that's actually possible. 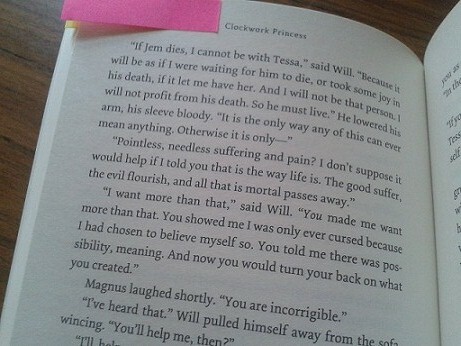 <3 I loved every second of Clockwork Princess. She was perfect. This review, well, it won't be a proper review. I don't want to spoil anything for the readers. God knows, I was avoiding Twitter and Goodreads for a week for fear of spoilers. But I will state exactly why this book is one of the best books ever written. This book was written is such a beautiful way. There were moments where my heart was aching so badly. Whether for Will, or for Jem, for Tessa or for all of them together. But, it was written so beautifully that I couldn't blame or hate either of them. All I could do was stare and having my heart broken. And it was absolutely amazing. Gideon and Gabriel. OMG who would have ever thought that these two would be so hilarious?! They were so funny that I was laughing so much that tears stared sparkling in my eyes. And Magnus!! Oh. My. God. Magnus Bane is the most wonderful and amazing and incredible and hilarious and heart-breaking character ever. I love him from the deep of my heart and I wish I had a friend like that. There is something about him that.. you just need to love him. When I finished the book, I was absolutely speechless. All I could think was "This is magic in its purest form. This is better than any poetry. This is what unconditional love looks like. This is one of the best bookish moments in my entire life." And I finally understood what once Cassandra Clare said. She said "For me it's not whether Tessa will end up with Will or whether she will end up with Jem. It's more than just a love triangle." Did I ever get it! And for me it was true. Through the book, all the feelings that surfaced through my body, yes, in a way, it didn't matter. It was just so beautiful and believe me, I couldn't in the furtherest imagine such a perfect ending. I will keep this book close to my heart for eternity. 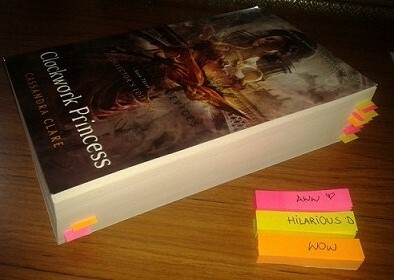 Clockwork Princess was more than just a good story, or a complicated romance. It was about exsistencial questions. Questions about doing what is right or doing what is easy. The relation between being selfless or being selfish. And everything put together made this book so much more powerful. *This book is too important to me to call it - it. 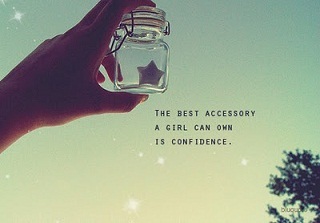 It's a she <3 And if it wasn't so huge I would actually have her in my purse all the time, just to keep it close to me. Thank you for commenting on my mailbox. <3 Uhm, psst, you commented this on my post, and it sort of broke my heart. "The years of Shadow? Is it an actual book or a children book?" Oh my goodness, I can't believe you made yourself wait a whole week to read it! Now that is what I call willpower! This book was definitely so much more than I expected and SO much more than just a love triangle. I just loved reading your review, Nea! Reading it made me nostalgic for all the happy and hilarious moments of CP2.